I originally bought the stamp set because my son and his partner recently acquired a hedgehog and I couldn't resist the creative possibilities! Then my husband commissioned a birthday card for his 5-year old granddaughter who lives in Sweden, and the Hedgehugs critters seemed perfect! 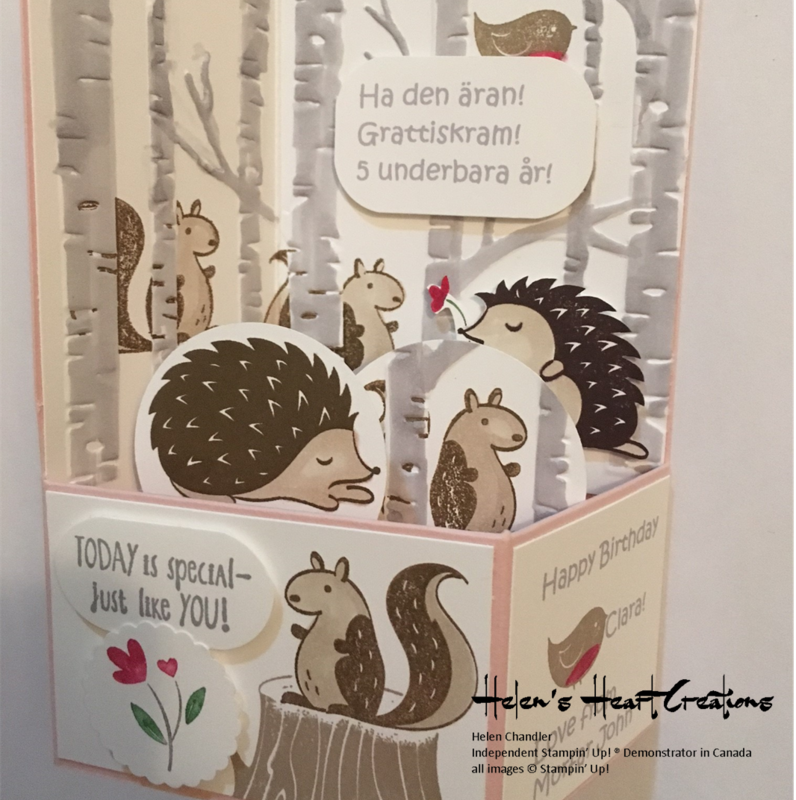 The greeting is in Swedish and I created it in MSWord using the RGB colour code for Smokey Slate to match the trees, and printed it on Whisper White Cardstock. The card is a variation on the card-in-a-box cards that I have seen before. I used two sides as the backdrop instead of the usual single side at the back. 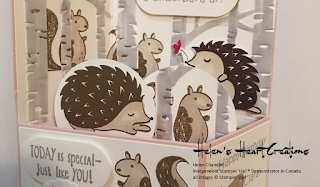 The squirrels are peaking our from behind the trees of the woodland scene – this was created by stamping the squirrels on the Woodland Embossing Folder before running it through the Big Shot. The other critters are stamped on circles of Whisper White Cardstock and adhered to the bars in the card-in-a-box. 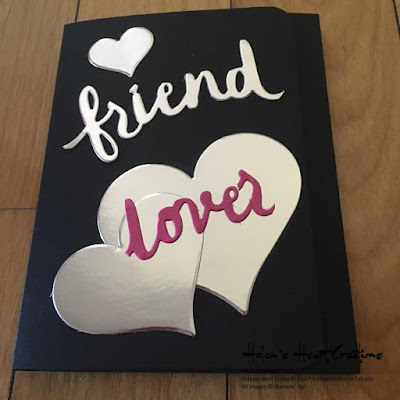 The base is made from Powder Pink Cardstock. I used Smokey Slate Stampin’ Blends to colour the embossed trees. The 3-d card folds flat for mailing. Please contact me is you would like more detailed instructions. Helen Chandler Stampin’ Up! 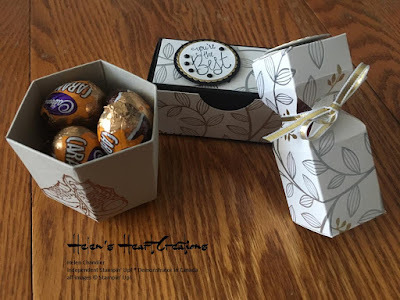 Independent Demonstrator in Canada You can buy Stampin’ Up! online easily 24/7 through my Stampin’ Up! shop. You can also join Stampin’ Up! with methrough links on my blog. Please contact me if you would like more information. You can find me on facebook, instagram, pinterest, and YouTube. What a cute card Helen! I know the lucky five year old will be thrilled with her card. Would you consider giving us the measurements for this beautiful and adorable card in a box? I really would love to case this for one of granddaughters as well! Thank you so much for sharing! The Envelope Punch Board, available from Stampin' Up!, is an amazingly versatile tool that opens up all manner of creative possibilities. This a box of 2x2" gift cards. The envelopes and box are made using the Envelope Punch Board. It is easy to create several at a time. The box can be sized to hod as many cards as desired. A great tool for calculating the paper size and punch interval is the Box Buster from The Crafty Owl. For envelopes, put 0 in the "height" measurement or use her Envelope Expert tool. Thank you Joanne James from The Crafty Owl for your generosity in sharing this tool. I am so grateful for the international community of crafters who share their expertise so readily - I call it "crowd-initiated innovation" as we all expand on each other's ideas. Ideas in this post have been CaSEd from Linda Parker of Papercraft with Crafty, Vicky Thompson from Penguin Crafts, and others. 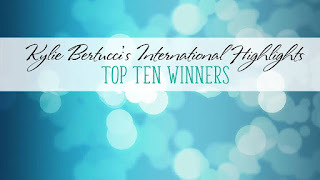 Thank you for visiting my blog today and coming to see my creation for Kylie Bertucci's International Blog Highlights this month (March 2018). She asked us to write about the story behind our entry in the theme: Love. My husband and I spend several months of the year apart because he is based in Europe and I am based in Canada. I created this little mini-album journal for him to take with him when he leaves on his next trip. He engaged in the creation of it, helping me to choose the photos and organise the pages, as well as taking some pictures. The album itself is a simple construction using Basic Black and Whisper White Cardstock. For the journal pages I used the Petal Passion Memories and More Card Pack.The images we picked include some of our times together in Europe and in Canada. Mostly we take pictures of each other - so finding one that someone else had taken of us together was a challenge! Extensive selection of high-quality stamping ans scrap booking supplies available here from Stampin' Up! My on-line store is open 24/7 here. If your order is under $200 (before shipping and taxes) enter the HOST CODE for a share in Rewards. Be sure to allow your contact information to be visible or I will not know who you are! If your order totals $200 or more (before shipping and taxes) you will earn your own Stampin' Rewards.